Learning from Life: Christmas starts in July! Yes, I know it is only July 17th, but I have been working for weeks on my Christmas project for work. I am going to start the 12 Days of Christmas kick off tomorrow and I am so excited. I just loved going today and setting up the shop with my little Christmas area, which will also include my Christmas clock that chimes Christmas songs each hour! Last year I did the 12 days of Christmas in a row ( except for Sundays ) and even though that was fun, it about killed me physically and mentally...that was a ton of work. So this year we got a bit wiser and decided if I taught 2 each month ...starting in July, then we would be able to have all 12 done by Christmas. So good night dear friends! One version of the legend says that long ago a poor old man without money for the weddings of his three beautiful daughters was approaching death. He worried about their futures. Saint Nicholas was passing through town, heard about this situation, and wanted to help, but knew the man would not accept charity. So that evening after everyone was sleeping, he peered through the window and saw the girls' stockings hanging on the mantelpiece to dry. He crept down the chimney and dropped 3 bags of gold coins into the stockings. The father and daughters awoke the next morning, amazed and joyful. And so, the girls were married and lived happily ever after. In Europe, this legend fueled the custom of hanging Christmas stockings. Children would hang their stockings or put out shoes for St. Nick to fill with gifts. 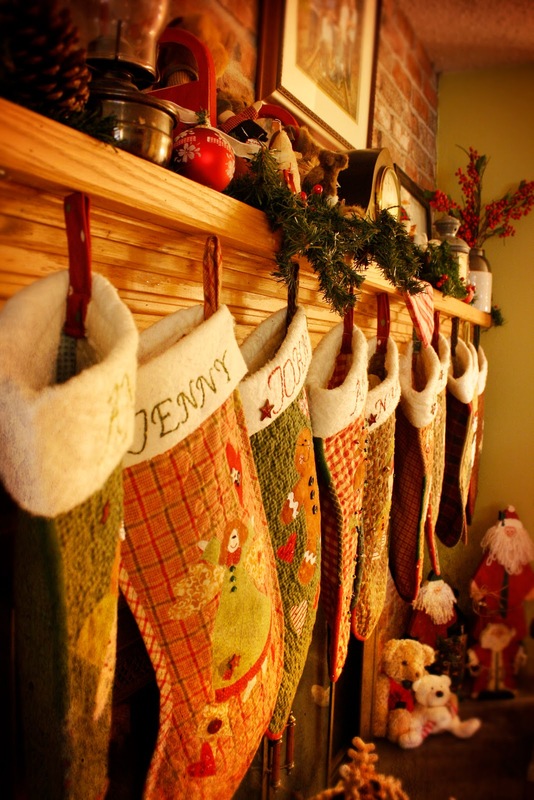 As time went on, specially decorated Christmas stockings were put out and the custom lives on.